The IT36 is tuned for a wide frequency band to include both FCC and ETSI regions and is optimized primarily for nonmetal surfaces, such as reusable plastic containers and wooden and plastic pallets. • Returnable & Reusable Plastic Containers (RPCs), including totes, bins, trays, and boxes. The Durable Asset Tags can be attached using screws, rivets, double-sided adhesive strips or a variety of other methods. 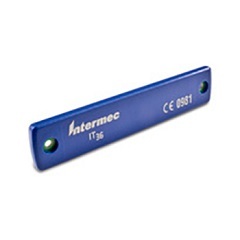 The Durable Asset Tags are compatible with any Intermec UHF RFID reader and or any competitive EPCglobal UHF Class 1 Gen 2/ISO 18000-6C reader.